CPS is proposing a half-dozen school co-locations, consolidations and closures for next school year, including a plan to consolidate Morton and Dodge elementary schools. In a surprise move, the Chicago Public Schools administration is recommending that Spry Community Links High School in Little Village co-locate with Saucedo and Telpochcalli elementary schools across the street. The proposal is one of a half-dozen so-called “school actions” that the administration announced on Tuesday, the deadline for CPS to publicize closures, consolidations, co-locations and attendance boundary changes for the upcoming school year. Except for the Spry case, details on most of the other proposed school actions had already been reported. CPS is proposing to move Spry’s high school one grade at a time over the next three years. Currently the high school is split between the building it shares with Spry Elementary and a leased space in an adjacent Boys & Girls Club building. CPS officials say the co-location would allow CPS to end the lease and save money — about $90,000 a year. But the plans came as a surprise to some staff at the schools. Saucedo and Telpochcalli have been co-located for nearly 20 years, Cosme says, and the schools share a lunchroom, gym and auditorium. Saucedo, a magnet school, enrolls about 1,200 students while Tepolchalli, a dual-language school, has about 300. Already, they’re short on space, Cosme says. According to CPS facilities data, the building that houses Saucedo and Telpochcalli can hold 1,680 students — just enough to accommodate all three schools’ current enrollment. Spry’s founding principal, Carlos Azcoitia, says the long-term goal is to expand the high school’s enrollment. Sarah Chambers, a special education teacher at Saucedo, fears CPS will make room for the high schoolers by eliminating Saucedo’s library and dedicated special education classrooms. She expects staff and parents will turn out in droves to contest the co-location at the upcoming public hearings. Saucedo’s principal referred questions to the CPS communications office, and Spry’s principal did not respond to a request for comment. Azcoitia, a former CPS School Board member who led Spry until 2007, says the move is part of a larger plan to create a preschool-to-high-school pipeline in Little Village. He was unsure about whether the elementary schools would eventually accept fewer students as the building begins to accommodate high school students, but says demographic data indicate there will be fewer students overall in the area. Three public hearings must be held before the Board of Education takes a vote in February. (See here for a schedule of meetings.) CPS released the proposals in compliance with a state law regulating school closures, co-locations, consolidations and attendance boundary changes. * The consolidation of three Austin high schools with dwindling enrollment that were once part of Chicago’s “small schools” movement. Under the proposal, Austin Polytechnical Academy and Austin Business and Entrepreneurship would consolidate into VOISE Academy. The plan was drafted by Austin’s Community Action Council (CAC) and has the support of the schools’ principals. “If we and CPS all work together, then we can potentially set VOISE as a model for neighborhood high schools in an area where you have a large number of at-risk students,” says community activist Dwayne Truss, who sits on the CAC. Altogether, the schools enroll just over 400 students. Consolidating the schools means only one principal will remain. During a press conference last month, Wayne Issa, principal of Austin Business and Entrepreneurship, and Ali Muhammad, principal of Austin Polytechnical, both said they’re okay with that. “We want to do what’s best for the students,” Muhammad said. * As part of the Austin plan, CPS is proposing to reassign the current attendance boundaries for nearby Douglass Academy to the new VOISE Academy. Douglass would then become an open-enrollment, citywide high school. Douglass’ principal did not respond to a request for comment. Few students from within Douglass’ boundaries choose to attend that school, and even fewer from other parts of the city do. District data show that 1,886 high school students live inside its attendance boundary, but only 177 attend the school. Only 57 from outside the attendance area attend. 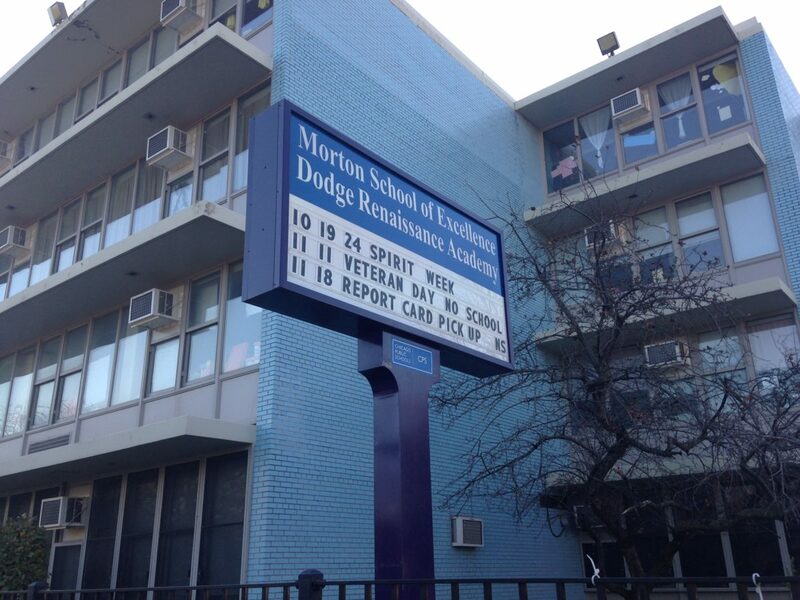 * The consolidation of Dodge Renaissance Academy into Morton School of Excellence, in the East Garfield Park neighborhood. Both elementary schools are run by the nonprofit Academy of Urban School Leadership (AUSL), which manages the district’s so-called “turnaround” schools. They have been co-located since 2013. Some parents and teachers at Dodge say they were upset about the proposal, which was quietly drafted by the schools’ principals and submitted to the district in October. Principals at the two schools initially denied during staff meetings that they knew any specifics about plans to consolidate. Only after being questioned last month by Catalyst, did they admit they were its authors. Dodge has 122 students; Morton has 340. Both schools received the second-lowest possible rating under the district’s five-tier rating system, although Dodge has a slightly higher overall score. * The co-location of a new KIPP elementary charter school campus with Orr Academy High School, which is also an AUSL school. CPS tentatively OK’d the opening of the KIPP campus earlier this fall, pending Board approval of the co-location. Orr’s principal and teachers protested KIPP’s proposal during a public hearing in October. Just over 400 students are currently enrolled at Orr, and the freshman class is smaller than the senior class. * The closures of Montefiore Special Elementary School and Marine Military Math and Science Academy. CPS had already, in effect, shuttered Montefiore this summer, and Marine last year, but had refused to call either case a closure. Critics saw that as a largely semantic point made so that CPS could say that it hadn’t broken its own promise not to close any additional schools during the five-year period after the massive 2013 school closings. Noticeably missing from the list is a proposal to merge Ogden International and Jenner Academy on the Near North Side. A community-led effort coalesced earlier this year to merge the schools as a way to solve Jenner’s under-enrollment problem and Odgen’s overcrowding. Historically, Jenner has served mostly poor and black students while Odgen enrolls more white and affluent students. Michael Beyer, Ogden’s principal, says the merger “became politically unpopular” after a “very vocal group of parents” at Odgen opposed the plan. A few Jenner community members also opposed the plan, he says, because they don’t trust the district’s ability to consolidate schools. Beyer says a group of Jenner and Ogden parents “who are still very much interested and in support of the consolidation” are going to work to make the merger plan more detailed and to drum up additional support. They’ll eventually take the plan to CPS for approval, he says. *This story was updated on Thursday, Dec. 2, 2015 at 1:30 p.m. to reflect an additional response from CPS.